My rhyming children's picture story book Fairy May will be available as a free kindle download on both 27th and 28th April giving you a whole weekend to take advantage of this fantastic offer. If you don't own a kindle you can still grab a copy to read by installing the free kindle app offered by Amazon to your PC, ipad, tablet or iphone. It only takes a minute to install and means you'll be able to take advantage of all the great content that's out there for kindle. 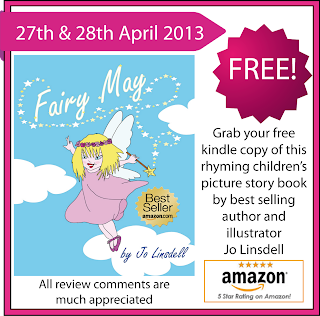 Once you've downloaded and read your copy of Fairy May please take a minute to leave me a review on Amazon. It really does make a difference. I'd also really appreciate your help in spreading the word about this offer. Thanks in advance and I hope you enjoy Fairy May. You have a great blog there! Also, take out some time and check out the timeless classic, The Special Guest written by Lee Allen. The Special Guest is a true heartwarming and inspiring Christmas story about a family’s tragedy and how they come to learn of a plan greater than themselves. The timeless truths of this holiday book will make for a reading delight for both young and old – touching all with the sentiments that make Christmas so special.